Under its seasonal covering of snow or frost, the winter garden appears dead and lifeless. Brave splashes of colour come from witch hazels, viburnums and a few other shrubs. But the majority of the garden seems to be sleeping, waiting for the warmer weather and longer daylight hours. This is an illusion. The garden never sleeps, and all winter there are subtle but vital changes taking place. Under the soil, the cold is working its magic on seeds, bulbs and roots. Even the chill winds have a role to play to ensure flowers and fruits appear later in the year. Without the winter cold, gardens would be less beautiful in the summer. A period of cold weather is essential to many plants and crops. Without it, some would struggle to grow at all, while others would not flower or produce crops. One example of crops that need a cold spell are fruit trees such as apples, plums and pears. If temperatures remain high, these trees would not come into growth in spring, nor produce flower buds. In a process known as vernalisation, the reduction in daylight initially induces the trees to go dormant. They shed their leaves, which would require too much energy to maintain in winter when they make less food. Then the trees must be exposed to a certain number of days with a minimum temperature, usually less than 7°C. Only when this has happened are they ready to burst into growth and bloom when temperatures rise. This process is designed to ensure this happens in spring, and not in autumn. The amount of days of cold required is expressed in chill hours. Some require longer periods of cold than others, although the reason for this is not currently known. However, the plants are believed to store the necessary information and pass it on in their genes. Hardy bulbs need different weather conditions at different times of the year to grow and produce flowers. Flower bulbs are formed in summer, as a result of heat in a process called baking. Root growth is stimulated by the cooler and wetter weather of autumn. However, it is the cold of winter that is needed to stimulate stem growth. Temperatures of 10°C or below trigger the elongation of the flower stem. Attempts to grow hyacinths or daffodils in the home often results in hyacinths with a clump of flowers crowded in the neck of the bulb or daffodils on dwarf stalks. This is the result of ignoring the bulbs’ need to spend at least 10 weeks in cool conditions, ideally outside below 10°C. There are exceptions to this such as ‘Paperwhite’ and ‘Soleil d’Or’. Native to warm Mediterranean regions, they do not need a period of cold for their stems to grow. It is autumn rain, rather than winter cold, that spurs on these daffodils’ growth. In winter, herbaceous plants stop growing and die back. Instead, they store the carbohydrates they make from water and carbon dioxide from the air in their roots. This provides the plants with a reserve of energy, designed to give them a head start in spring. They store the carbohydrates as starch because this is more concentrated in energy (calories) than simple sugars. Starch is not water soluble, making it difficult to move around the plant in the sap. The onset of cold weather, however, triggers enzymes in the root to convert the starch back into soluble sugar. This means it can be moved to the growing tips of the plant, ready for early spring’s surge of growth. Once the conditions are right, they are able to push their shoots to the sunlight ahead of surrounding plants such as annuals. This stops the new growth from being smothered by the hundreds of annual seedlings which are germinating at the same time. Peonies and dahlias are both examples of the wide range of plants this benefits. It is also the reason why parsnips taste sweeter after they have been frosted. 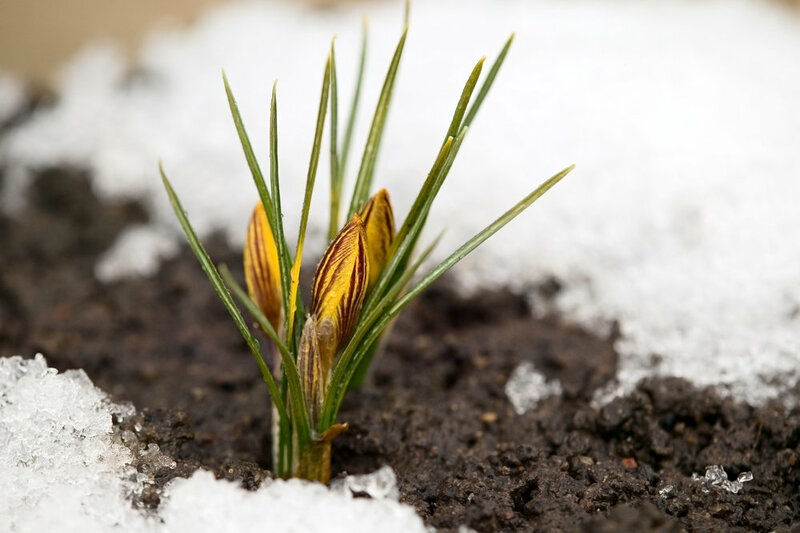 When grown from seed some plants need a cold spell before they will flower. These include biennials such as wallflowers, aquilegias, sweet Williams and onions. Blooming in late spring, they release their seeds in summer. If the seeds germinated immediately, they would flower and set seed as soon as they were big enough. These new seeds would not have time to ripen before winter arrived. The cold weather would kill them, with the loss of a whole generation. Instead the plants make healthy clumps of foliage the first year. Then they wait for a sufficient winter chilling before producing flowers. No matter how early in spring these seeds are sown, they will only produce leaves in the first year, never flowers. The necessary cold period to stimulate flowering can be very short. Several biennial plants, such as parsnips, carrots, beet and onions, are grown as vegetables. The starches and sugars stored in their roots provide valuable food when eaten. If these vegetables are sown too early in spring, there is a risk of short cold snap while they are growing in April or May. This could fool them into thinking that winter had come and gone, and it was time to flower. At this point the plants ‘bolt’, sending up flower stems and the crop is lost to the gardener. The biennials above require winter chilling to make them flower. There are other plants, however, that need their seeds to be vernalised before they germinate at all. The seeds undergo a period of dormancy. In some cases, simply the softening of the hard coat by frost and weathering action will allow the seed to germinate. This applies to some lathyrus species including sweet peas. In other cases, this weathering is linked to the need for a cold, moist period. This triggers the seed’s embryo to grow and expand. It breaks through the softened seed coat seeking the sun and nutrients. Seeds do this because if they germinated in autumn, the seedlings would be unlikely to survive the winter. If frost did not kill them, grazing animals, slugs and snails would eat them in the absence of other food. Delaying germination till spring gives every seed a better chance of survival to maturity. All these processes show that winter is not just a time of frosty beauty. Its chilling weather creates more than a snowy landscape, it plays an essential role in ensuring that the following season is as productive and beautiful as the last. The feature about the importance of cold weather for the garden originally appeared in the Jan / Feb 2016 issue of LandScape. For back issues click here, or to subscribe to LandScape, click here. Onclear, still winter nights, a delicate covering of crystals turns the countryside white. The phenomenon is hoar frost. Leaves, flowers and stems are covered with delicate patterns. 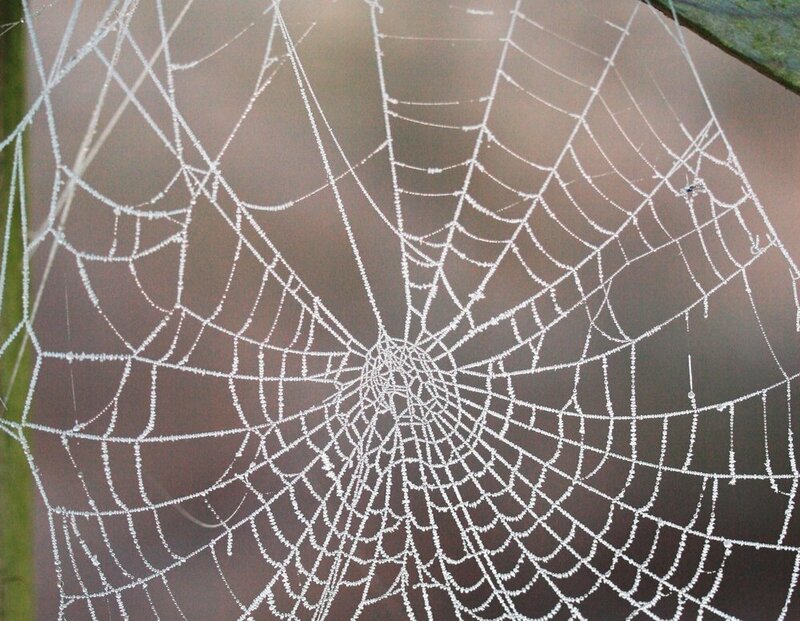 Spiders’ webs are outlined with a fragile coating. Fine feathers and needles turn grass silver and give trees a ghostly frame. The name hoar comes from the old English word, hor or har, for white or grey. These frosts form on cold, cloudless nights, with little or no wind. The conditions must be right for crystals to form directly from water vapour present in the air. This process is called sublimation and happens when air changes to a solid without passing through a liquid stage. A true hoar frost is formed solely by sublimation, and is neither frozen dew nor droplets of water. In practice, the frost is often a combination of frozen dew and sublimation. On these nights, the ground, and the air just above it, steadily cool as they rapidly lose heat to the atmosphere by radiation. Eventually the dew point is reached – this is the temperature at which water vapour in air condenses into liquid water. Both the air temperature and the dew point need to be below the freezing point of water for hoar frost to form. When the radiation persists, and the temperature continues to drop, the air becomes supersaturated with moisture. The excess moisture is deposited in the form of needle-like crystals that bind themselves onto surfaces. 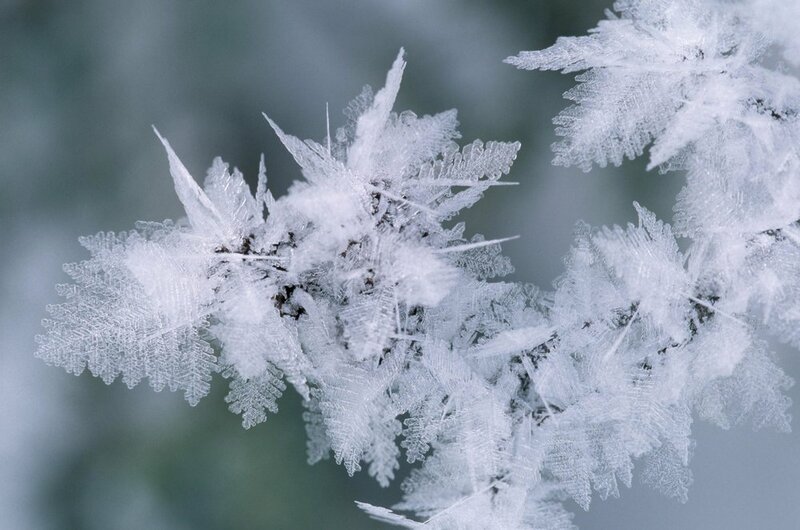 If there is a lot of moisture available during the long winter night, hoar frost is formed in a thick layer. This can resemble a covering of snow. The pure white is caused by the reflection and refraction of light as it interacts en masse with the frost’s crystalline structure. An area of high-pressure during the winter will provide the quiet conditions suitable for the formation of a hoar frost. An old weather rhyme says ‘clear moon, frost soon’. When it occurs on successive nights, and does not melt during the day, an ever thicker coating of crystals are formed. This can be 1in (2.5cm) or more long. Conversely a cloudy sky or windy conditions inhibits radiation, preventing a frost. It is possible for a lawn to be coated with hoar frost while trees and shrubs are frost-free. This happens when the ground temperature is several degrees colder than the air higher up, which remains above freezing point. 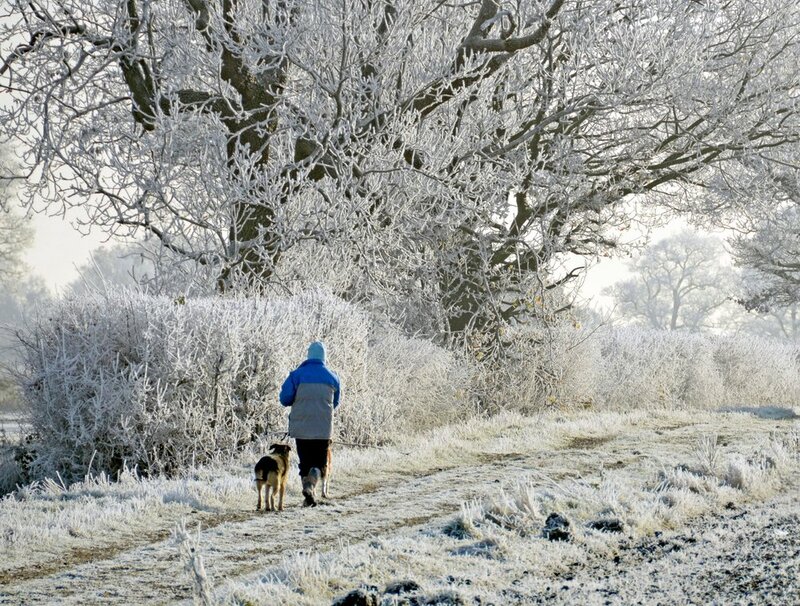 Places that are particularly susceptible to a frost are known as frost hollows. As air chills its density increases. On a clear night, slopes in undulating country lose heat by radiation cooling the air above them. The cold air runs downhill like water into hollows and valleys. It is known as a katabatic flow, from the Greek word katabatikos, meaning downhill. If it is trapped by embankments across the valley or by natural spurs jutting outwards, a lake of cold air can form. The valley floor is coated with a thick hoar frost whereas higher up may be frost free. During March 2012 there was only one air frost at a weather station in east Surrey situated above a downland valley. A weather station close by on the floor of the valley recorded 16 air frosts. Gardeners can inadvertently create frost pockets by building a solid fence across a slope. The type and texture of soil is also a factor in contributing to the likelihood and severity of a frost. Sandy soils lose heat more rapidly and reach the frost point more readily than a clay soil. Moist soils will not cool as briskly or lose as much heat. Hoar frost can be harmful to more delicate plants, shrubs and trees. Water freezes within the plant’s cellular structure, breaking down the walls. A vulnerable time is just after dawn when the air is often at its coldest. Rays from the rising sun are cast onto foliage, causing a rapid defrosting. This ruptures the sides of the plant’s cells when the sap expands. By putting fleece covers over plants, frost is prevented from forming on the plants themselves and averts that sudden thawing. Plants inside a glass cold frame get some protection from a coating of hoar frost. The covering raises the temperature inside by several degrees, giving some protection from radiation. The longer the duration of the frost, the more a plant suffers. It is the buds and flowers that are most tender. One plant that is susceptible is Magnolia soulangiana. A mild winter induces the tree to flower early, then a spring frost scorches it. In an average year, many places will have twice as many grass or ground frosts than air frosts. Air temperatures measured at 4ft (1.2m) can often be up to 40C higher than those on the lawn, flower bed or vegetable patch. A thick hoar frost can blacken potatoes while the blossom high on an apple tree may be untouched, remaining just above freezing. The effects of nature’s frozen tracery are unpredictable, but its beauty remains one of the wonders of the winter. The feature about hoar frost originally appeared in the Christmas 2014 issue of LandScape. For back issues click here, or to subscribe to LandScape, click here.